In recent years, widening global imbalances have been one of the biggest concerns in international economics. China and many other emerging market and developing countries have increased their current account surpluses significantly since the early 1990s. This phenomenon has been largely, if not entirely, driven by reserve accumulation (Alfaro et al. 2014, Gourinchas and Jeanne 2013). Studying reserve accumulation gives us new evidence on how the real exchange rate is determined. The link between external wealth and the real exchange rate has been a central mechanism of international economics for a long time. The standard textbook view stretches all the way back to the seminal works of Hume and Keynes. It argues there is a clear steady-state relationship in which the real exchange rate (RER) appreciates more appreciated if net foreign assets rise to a higher level, all else equal. In recent work (Choi and Taylor 2017), guided by a new theory, we ask whether public external assets – reserve accumulation – can overturn this standard view, especially when combined with capital controls. We then ask whether the policy combination of reserve accumulation and capital controls is related to other macroeconomic variables, such as the trade balance and GDP growth. We argue that the motivation of policymakers to be precautionary or mercantilistic offers an insightful framework that we can use to understand the nuances of this crucial external adjustment mechanism. Building on the empirical framework of Lane and Milesi-Ferretti (2004) for 75 countries between 1975 and 2007, we first confirm that the marginal effect of private asset accumulation on the RER is appreciation, consistent with older findings. The marginal effect of public external assets – reserve accumulation – is, however, the opposite. The variation in the RER also critically depends on capital controls. In financially closed economies, capital controls have a strong association with depreciation. 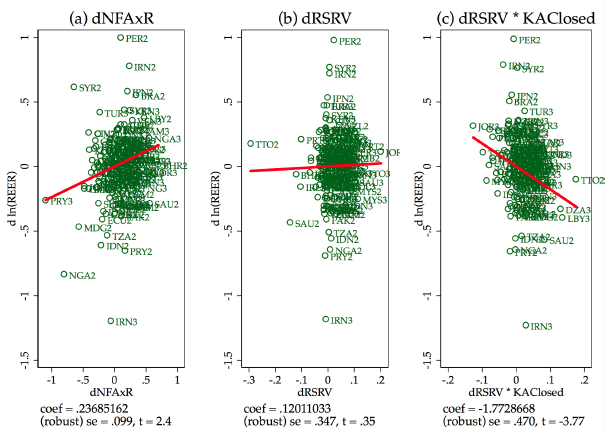 Figure 1 shows the main results from OLS differences-in-differences estimation. We split 33 years into three cross-sections, take the average of each period, and then take differences between periods. As in Lane and Milesi-Ferretti (2004), the terms of trade and relative real GDP per capita are included as controls. The first figure (left) confirms that when NFA (net of reserves) increases by one percentage point, RER appreciates by 0.24%. 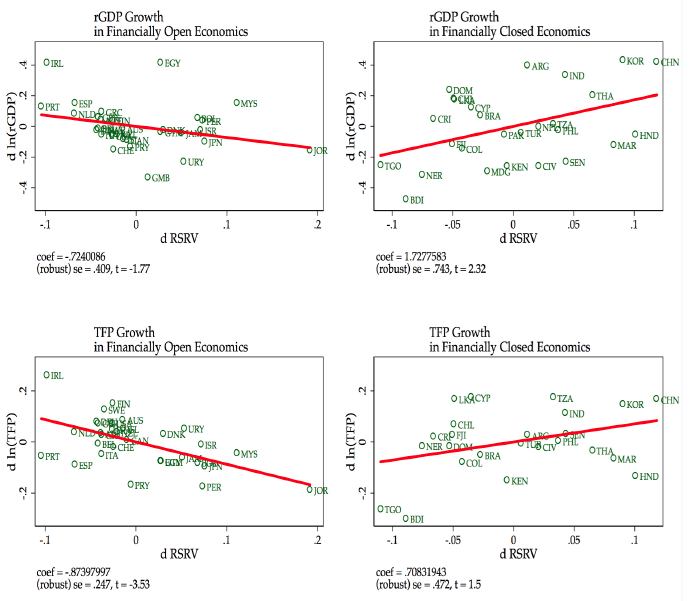 However, when reserve accumulation increases by one percentage point, RER appreciates by 0.12% in financially open economies (centre), but depreciates by 1.65% (0.12% minus 1.77%) in financially closed economies (right). 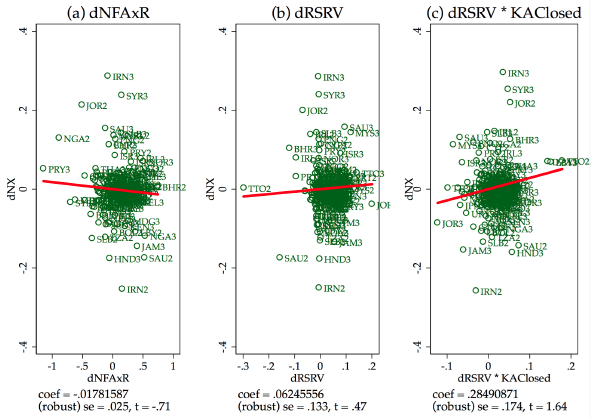 These findings are then replicated in annual panel country-fixed-effects estimation, and with many robustness checks. Notes: Pooled cross-sectional analysis for 75 countries over the period 1975–2007. The REER increases when appreciates. NFAxR denotes net foreign asset to GDP (net of reserves), RSRV denotes reserve accumulation to GDP, and KAClosed denotes the binary code of capital control, constructed from Chinn and Ito (2008). We take the average of variables over the periods 1975–1985, 1986–1996, and 1997–2007, then take the difference for pooled cross-sectional analysis. How can we account for these new empirical results? We argue that the intertemporal reallocation of tradable goods consumption, in the presence of both reserves and capital controls, is a key to understanding our new findings. We use a small open economy model with tradable and nontradable goods (as in Jeanne 2013). The law of one price holds at the tradable goods level. What we call the capital account policy – which means reserve accumulation and capital control choices – then shapes the equilibrium trade balance. In the basic configuration, if the economy has a positive (private) external wealth shock, its consumption will increase and smooth the shock. The relative price of nontradable goods rises, a real exchange rate appreciation, which is the wealth effect in the standard model. We then add several new ingredients to the standard model that overturn this prediction. First, we show that public external saving, reserve accumulation, is an important additional channel which affects the allocation of tradable goods consumption between current and future periods, and hence the real exchange rate. Given the endowment of tradable goods, if the current reserve accumulation are high enough, current consumption of tradable goods may decrease, and the relative price of nontradable goods may also then decrease. The real exchange rate may then depreciate, and the price level of the home country would decrease. This would reverse the predictions of the standard model. Second, we show that capital controls could be an important factor modulating this new mechanism in our framework. That is, the marginal effect of reserve accumulation on the real exchange rate varies with the degree of financial openness. In our model, the effectiveness of deliberate policy efforts to change the capital account (via reserve accumulation) depends on the extent to which official capital flows are offset by private capital flows. With this rationale spelled out in the model, we argue that capital account policy needs to view reserve accumulation and capital control together as jointly determining the equilibrium macroeconomic outcome. Figure 2 provides supporting evidence that net exports, the channel through which the capital account policy affects real exchange rates, is associated with these policy configurations in our data. Reserves are weakly (strongly) associated with net exports in financially open (closed) economies. Notes: Pooled cross-sectional analysis for 73 countries over the period 1975–2007. NX denotes net export to GDP, NFAxR denotes net foreign asset to GDP (net of reserves), RSRV denotes reserve accumulation to GDP, and KAClosed denotes the binary code of capital control, constructed from Chinn and Ito (2008). We take the average of variables over the periods 1975–1985, 1986–1996, and 1997–2007, then take the difference for pooled cross-sectional analysis. Finally, we develop a theoretical explanation for capital account policies – the simultaneous choice of reserve accumulation and capital controls – by a policymaker. Here the model encompasses both the so-called mercantilist and precautionary motives for reserve accumulation, and this is what connects capital account policies with real exchange rate determination. Rather than asserting that one motive is more influential than the other, we incorporate both motives into an integrated framework. We embed the mercantilist motive (Rodrik 2008, Korinek and Serven 2016), in which net exports generate a positive technology spillover, and thus a learning-by-doing externality on growth. We embed the precautionary motive (Obstfeld et al. 2009, Jeanne and Rancière 2011), which holds that a country accumulates reserves to cope with output losses or financial instability in a ‘sudden stop’ crisis. If an economy is more vulnerable to a crisis, the government will want to accumulate more precautionary savings in the form of reserves. At the same time, the private sector will want to expand its balance sheet as a reaction to the government financing of the additional reserves. The private sector will increase its holdings of the domestic bonds that the government sells (this is effectively the same as present and future tax payments, under Ricardian Equivalence). At the same time it will increase issuance of external debt to fund these outgoings and smooth consumption. If more such private external borrowing is needed, the government would then then wish to liberalise capital controls (by reducing capital-flow taxes), trading this policy off against the mercantilist incentive to impose capital-flow taxes to promote export-led growth with a weaker real exchange rate. On the other hand, if an economy has more learning-by-doing externalities related to a trade surplus, the government will seek to improve its trade balance. To achieve this, the government will want to accumulate reserves. At the same time, it will also want to reduce private capital flows. Less private external borrowing is needed, and so the government will then want to tighten capital controls (increase capital flow taxes) which now aligns with the mercantilist incentive to impose capital-flow taxes to promote export-led growth with a weaker real exchange rate. Finally, we provide some empirical evidence to back up this part of the story. Figure 3 shows a cross-sectional bivariate scatter plot of reserves and real GDP per capita (or TFP) growth between periods 2 (1986–1996) and 3 (1997–2007). While there is a negative relationship between reserve growth and real GDP per capita (or TFP) growth in financially open economies, the relationship in financially closed economies is clearly positive. Notes: Simple bivariate relationship between reserve growth and real GDP per capita growth between period 2 (1986–1996) and 3 (1997–2007). Oil exporting countries are excluded. Constant is included in bivariate regression. Real GDP per capita and TFP are from PWT9. Inspecting the figures, we can see that these patterns are notably driven by South Korea, China, and several other East Asian countries. The dramatic increase in reserves is associated with a high real GDP per capita growth, and TFP growth, all of which is consistent with our model’s predictions. To confirm the robustness of these results we do a complete analysis of cross-sectional and annual panels (these are provided in Choi and Taylor 2017). We have documented new stylised facts about real exchange rates. Our empirical results show that between 1975 and 2007, controlling for GDP and the terms of trade, private external assets were associated with appreciation of the real exchange rate. Yet public external assets had little effect on the real exchange rate in financially open countries, and were associated with real exchange rate depreciation in financially closed countries. Our theoretical model of precautionary and mercantilist motives uses two competing forces to account for the result. On one hand, the desire to hold reserves as precautionary stockpile against crisis losses and capital market exclusion. On the other hand, the desire to use real exchange rate and capital account policies to force external saving through a trade surplus when there is an export-led growth externality. We have provided further empirical evidence on growth and TFP outcomes consistent with these model mechanisms. Laura, A, S Kalemli-Ozcan, and V Volosovych (2014), “Sovereigns, Upstream Capital Flows, and Global Imbalances”, Journal of the European Economic Association 11(5): 1240–1284. Chinn, M D, and H Ito (2008), “A New Measure of Financial Openness”, Journal of Comparative Policy Analysis 10(3): 309–322. Choi, W J, and A M Taylor (2017), “Precaution versus Mercantilism: Reserve Accumulation, Capital Controls, and the Real Exchange Rate ”, CEPR Discussion Paper 11963. Gourinchas, P-O, and O Jeanne (2013), “Capital Flows to Developing Countries: The Allocation Puzzle”, Review of Economic Studies 80(4): 1484–1515. Jeanne, O (2013), “Capital Account Policies and the Real Exchange Rate”, NBER International Seminar on Macroeconomics 2012 edited by Francesco Giavazzi and Kenneth D. West. Chicago: University of Chicago Press: 7–42. Jeanne, O, and R Rancière (2011), “The Optimal Level of International Reserves for Emerging Market Countries: A New Formula and Some Applications”, Economic Journal 121(555): 905–930. Korinek, A, and L Serven (2016), “Undervaluation through Foreign Reserve Accumulation: Static Losses, Dynamic Gains”, Journal of International Money and Finance 64: 104–136. Lane, P R, and G M Milesi-Ferretti (2004), “The Transfer Problem Revisited: Net Foreign Assets and Real Exchange Rates”, Review of Economics and Statistics 86(4): 841–857. Obstfeld, M, J C Shambaugh, and A M Taylor (2010), “Financial Stability, the Trilemma, and International Reserves”, American Economic Journal: Macroeconomics 2(2): 57–94. Rodrik, D (2008), “The Real Exchange Rate and Economic Growth”, Brookings Papers on Economic Activity 39(2): 769–797.